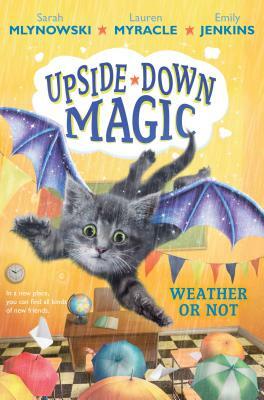 When Willa's upside-down magic rains, it pours. Clouds form under ceilings. Classrooms get flooded. Nory and the kids in Ms. Starr's Upside-Down Magic class always have umbrellas nearby, just in case. Willa hates being the source of such sogginess. And yet the more she rains, the worse she feels . . . and the worse she feels, the more she rains. Nory, meanwhile, can't wait to celebrate her first Bing Day-her town's magical holiday. There's even a parade! Too bad she's stuck doing her Bing Day class project with drippy Willa. To make things worse, Elliott seems to be taking Willa's side on everything. All the storminess is threatening to flood the UDM friendships. Will they drown in misery? Or can they use their magic to make the storm clouds disappear? Lauren Myracle is the New York Times bestselling author of many books for young readers, including The Winnie Years (which begins with Ten), the Flower Power series (which begins with Luv Ya Bunches), and the Life of Ty series. She would like to be a Fuzzy so she could talk to unicorns and feed them berries. You can find Lauren online at laurenmyracle.com. Emily Jenkins is the author of many chapter books, including the Toys trilogy (which begins with Toys Go Out) and the Invisible Inkling series. Her picture books include Lemonade in Winter, Toys Meet Snow, and The Fun Book of Scary Stuff. She would like to be a Flare and work as a pastry chef. Visit Emily at emilyjenkins.com.